The symptom of the problem is that the computer is stuck in the Windows 10 startup repair loop where the startup repair always failed and not working. Regardless of how many times you reboot your PC, it will still boot into the Windows 10 startup repair infinite loop recovery. 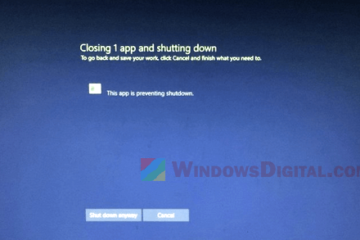 If that’s what you’re encountering now on your PC, here are some ideas on how to deal with the Windows 10 startup repair boot loop problem. The issue could be caused by a recent installation that causes conflicts that involves Windows 10 system files. For example, this may happen after a major Windows Update, a driver installation, or a faulty program or software installation. You will have to figure out what could be the cause so that you can remove the cause to fix the issue. If you suspect Windows Update to be the cause, try to roll back Windows 10 update to an earlier build. If there is no option to go back to previous version, you will have manually uninstall the updates from safe mode. To enter safe mode in Windows 10 with your current situation, there may be several ways. At the end of the startup repair when it fails, it should have a Restart button and an Advanced option button. Click on the Advanced option button, then navigate to Troubleshoot > Advanced options > Startup settings. From there you can select Windows 10 to boot into safe mode. If you see only the Choose an operating system screen, click on the Change defaults or choose other options link at the bottom of the screen. Then, follow the same steps mentioned above to navigate to the Startup settings. Select 4 to boot Windows 10 into safe mode. In safe mode, open Control Panel > Programs and Features > View installed updates. From here, you can remove any recent Windows update that you think may have caused the Windows 10 startup repair loop problem. 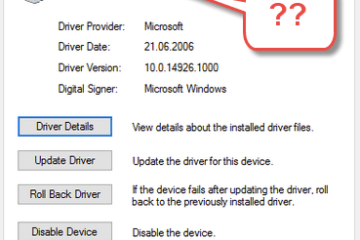 If you suspect anything else like a recent driver or a software installation, try to remove them in safe mode and see if the problem persists. Normally, when we face with such problem where we can’t boot into Windows 10, we will usually run a series of Windows 10 built-in repair tools first before trying anything else. These commands are useful to repair corrupted Windows 10 system files and fix Windows 10 boot errors. 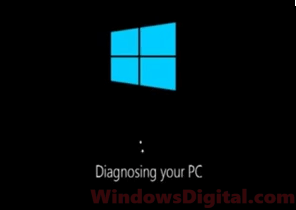 Go to this page: How to repair Windows 10 using command prompt, to learn how to run these tools without booting into Windows 10. This is the fix that actually works for most of our customer computers. You will need to have command prompt access. Refer to the method above to learn how to open command prompt without booting into Windows 10. Then, enter the following commands and press Enter after each line of command. Please keep in mind that the command below is assuming your Windows 10 is stored in C: drive. If your Windows 10 is stored in other drive, replace C: with the correct drive letter. This is an advance fix, please proceed at your own risk. The commands above are basically to backup your current registry files to a folder called Backup. Then, replace the current registry files with the backup registry created by Windows 10 earlier. After executing the commands, restart your computer and see if you’re still stuck in the Windows 10 startup repair loop. 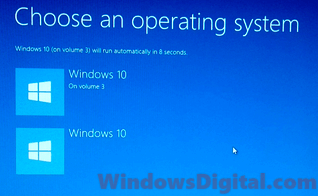 If you see multiple Windows 10 on volume [x] from the “choose an operating system” screen, select the second option for Windows 10 on volume 4/3/2. When you boot into it, you should see a black screen desktop with minimal to no icons and a working cursor. If you don’t see the symptoms as described, do not use this fix. Here’s what you can do. Use another computer that works to download Windows 10 media creation tool from here. Use the media creation tool to create a Windows 10 installation disk on a USB drive or any other type of external drive. 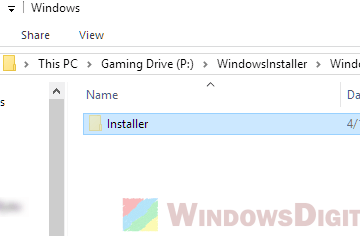 This process requires internet connection as it will need to download Windows 10 installation files to make the installation disk. When you have the Windows 10 installation USB ready with you, insert it to the problem computer which stuck in Windows 10 startup repair boot loop. Boot Windows 10 on another volume as mentioned earlier. In the black screen desktop, open task manager by pressing the CTRL-ALT-DEL keys. Click File > Run new task, then browse to the USB and run the setup.exe in it. Select Upgrade Windows 10 and deselect check for new updates during the process. When the installation process is completed, restart your computer and see if it’s still stuck in the Windows 10 start repair not working or failed loop. 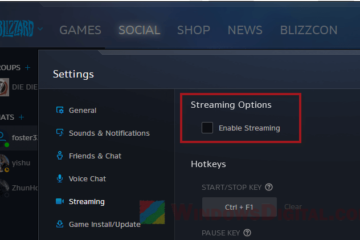 For better detailed instruction, you can refer to this page: Windows 10 Update choose your keyboard layout loop, and skip the first part about removing avast. If nothing else works, you may want to try system restore Windows 10 to an earlier date, or reset Windows 10 to factory default without losing files. 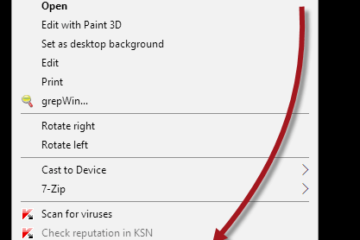 Description for sharing: Here's a few workarounds on how to fix the Windows 10 startup repair loop. Windows 10 startup repair always not working and failed, and you can't get into Windows 10 regardless how many times you restart your PC.